This week is Parent Observation Week at L's dance studio. They've been working since September on their skills and it was time to show them off. L takes dance two days a week. We started off with two classes on one day, but that proved a bit too long for a 5-year-old to focus in the late afternoon. Also the teacher told me L was too advanced for one of her classes and was consequently acting up a bit, so we switched up the schedule and everyone is much happier. Monday's class is a jazz/hip-hop combo. 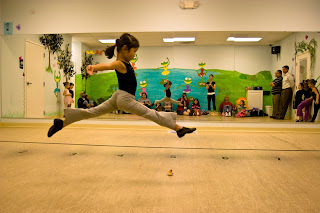 It seems to involve lots of jumping and shaking and pointing of toes. The girls showed off their stretching routine (it looked like a hard-core yoga class), some of their individual skills, and then they performed a little dance they'd been working on. L has been in this class for about 4 weeks, but she held her own with the other girls who've been working on this stuff much longer. L is extremely flexible. That knee grab may look impressive, but I've seen her sitting watching TV with her knees behind her shoulders like it was nothing at all. 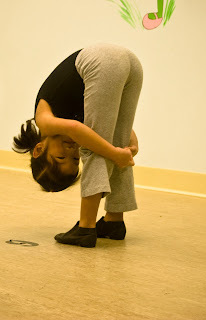 Even her teacher is amazed at how that child moves and twists herself into knots. Now *this* is impressive. Straight legs. Toes pointed. Arms thrown out to the sides. Fingers carefully together. A perfectly executed leap. I'm almost just as impressed that I managed to capture this shot so well. The final pose of her class' dance. Is she sassy, or what?! That "leap" photo is terrific, a prize winner! Save it for a photo contest.